Manufacturing is one of our region’s most important industries and a key contributor to the economies of both Southwest Washington and neighboring Oregon. To help manufacturers in both states meet their workforce needs, Workforce Southwest Washington (WSW) teams up with the workforce councils in nearby Oregon on numerous projects. Working together as the Columbia-Willamette Workforce Collaborative (CWWC), we meet with businesses to learn about their needs and bring together resources in education, training and employment services to help manufacturers find and hire new employees or improve the skills of their existing employees. Under the guidance of local manufacturing companies, WSW and its partners in the Columbia-Willamette Workforce Collaborative (CWWC) developed a three-point plan to address manufacturing’s workforce challenges. The CWWC team meets quarterly with manufacturing companies to gather information and present on strategies and achievement of plan goals. 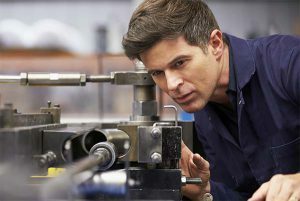 Manufacturing Workforce Plan 2019-2021 – The CWWC worked with manufacturing businesses to learn about their needs and develop this workforce development plan. Manufacturing Video – Learn how the CWWC can assist your manufacturing business by watching this four-minute video. Manufacturing Sector Report– Released in 2018, this report is a state of the manufacturing workforce in the areas served by the CWWC. Manufacturing Survey – In October 2012, the CWWC surveyed manufacturers in Southwest Washington and the Portland Metropolitan Area to obtain information on workforce needs and trends. If you’d like to get involved or receive notices of manufacturing meetings and/or the manufacturing e-newsletter, please contact Darcy Hoffman, Business Services Director at dhoffman@workforcesw.org or 360.567.3172. The Pacific Northwest Manufacturing Partnership (PNMP) is an alliance of communities in the Southwest Washington-Portland metropolitan area, Willamette Valley and Columbia River Gorge, which aims to accelerate the resurgence of manufacturing and create a competitive climate for job creation and private investment. The PNMP was formed in response to a federal initiative: the Investing in Manufacturing Communities Partnership (IMCP). In 2014, our region received the designation of “Manufacturing Community” that gives us elevated consideration for federal funds and assistance. Learn more here. Interested in competing for business that currently goes overseas? If so, the Make it in Washington grant for manufacturers may be for you. The program can help you improve your staff, expand productivity, plan for critical staff retirements and/or boost your profitability through strategic consulting, supply chain identification and management training. For additional information about programs for manufacturers, contact Darcy Hoffman, Business Services Director, at dhoffman@workforcesw.org or 360.567.3172.